Dad: Do you think our family is dysfunctional? Emily: Well… it’s more or less functional. I don’t remember which function was the topic of concern (perhaps all the times my father threatened, when we were misbehaving in the car, to pull over and make us run alongside?) or if that’s exactly what Emily said (perhaps she said, “Like most families, we’re more or less functional.”) or even if I was there (perhaps I was only told of this exchange, and my imagination promptly filmed it and added it to the memory storehouse). However, I have long considered Em’s comment brilliant. And two days ago her comment returned to me, when I realized suddenly how it applies to my family, the one I live with. Grace was home sick from school. She woke up with an earache and other unspecified complaints, and, without a fuss, I caved in and let her stay in bed, even though her forehead was oddly cool and her aspect rather alert. I called her in sick, and I rearranged my own commitments by e-mail. Sometimes I think a child takes a mental health day because she knows that one of her parents might also need a mental health day, and so when the child says she’s sick, the parent thinks, “Oh, that’s okay, I’m really stressed out and I don’t mind staying home,” and so they both end up having a mental health day. That’s the moment when I recalled Emily’s line about families being more or less functional. And, yes, I noticed too Grace’s skillful use of the third person, as well as the genderless “parent.” I mean, she wasn’t exactly accusing me of needing a break or herself of trying to give me one; this was all by implication. We did enjoy our shared mental health day: the earache resolved, lunch was enjoyed, books were read. 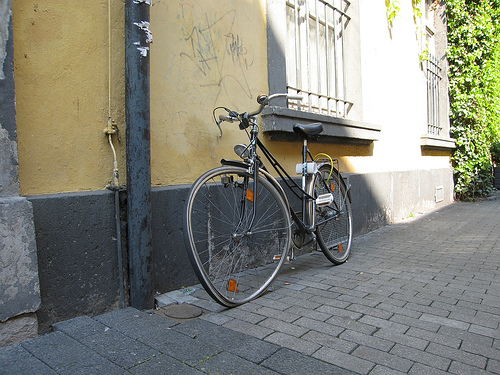 Bent-wheeled bicycle image from the traveler Inico at Flickr. P.S. Dad, I love you and I’m not trying to bust you — we always thought it was funny when you pulled the car over, and often we wished you would let us run alongside. This is why I love Grace. Oh, and my father not only *threatened* to kick us out of the car, but went so far as to actually *do* it on a numbered stretch of highway somewhere in the middle of the country (about halfway through our six week drive cross country in a green Vista Cruiser). It is forever etched in my mind. Hard to believe having known my father, huh? p.s. I consider my family to have been very functional & often use our interactions as a metric against which to measure all other family’s functioning. I recommend against doing that. Having known your father, I can imagine him chuckling as the three of you run alongside the car and then, at the end of the block, packing you all back in and taking you out for ice cream! p.s. It has been a comfort to me, as an adult, to realize that no family is without its struggles. It puts both childhood and parenthood in perspective. That doesn’t mean I don’t wish it weren’t all fabulous every effin’ day, but I think I mostly accept that it’s not. Not to sully my father’s memory, but to be clear, he dumped only two of us (and I am sure you can guess which two) ON THE OFFRAMP OF AN INTERSTATE! That said, I am quite confident he was chuckling and equally confident that he somehow rewarded us when it was all over. I enjoyed this post, you have a nice way about your writing. It sounds like your daughter was taking care of you a little bit that day, very sweet. Enjoyed browsing here. …the fact that daughter and mother sit and talk leisurely, though truantly, surely means there are higher levels of function than disfunction.